Deciding to change careers can be scary, exciting, overwhelming and freeing – all at the same time. Step back and do some self-assessment, clarify what’s important to you at this stage or your life, brainstorm options, research the ones that interest you the most, develop short and/or long-term goals and plan to get there, and put your plan into action. Start by reading this article on Change and Transition below. William Bridges, author of Transitions: Making Sense of Life’s Changes, differentiates between change and transition. Change is an external event. One day you are a college student, the next day a college graduate. One day you are living in Hometown, Pennsylvania; several days later you have moved to Awaytown, California. You have been working in a particular job for seven years; your manager informs you that your position has been eliminated, and you will be let go in two weeks. These are all external events. Transition is what takes place inside the person. It’s an inner reorientation, a self-redefinition that you have to go through in order to incorporate a change into your life. Bridges describes transition as a natural process of disorientation and reorientation. Transition can begin long before the change happens. My husband and I thought about and prepared for a move to the U.K. for a full year before we actually moved. The transition continued after the change occurred; it took half a year before we began to feel settled in the U.K.
Look at the examples of changes that people experience. Some of these are anticipated. 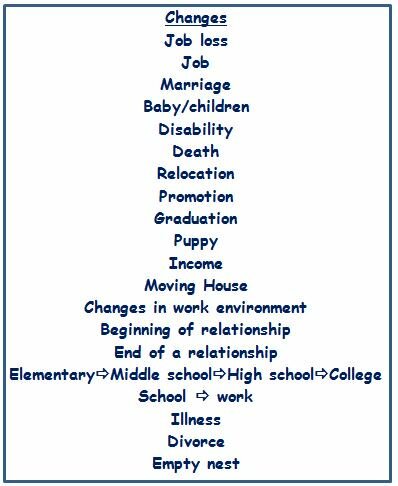 For example, there are ones that will occur in the lifespan of most individuals: graduating from high school, getting married, starting a job. Others are ones that you make happen, such as our move to the U.K. With an anticipated change, the transition begins before, sometimes very long before, the change occurs. Some of these changes are unanticipated. They are not expected, such as the death of a family member, being laid off from your job, or an unexpected inheritance. In the case of an unanticipated change, the transition does not begin until the change happens. Keeping in mind that transition is what occurs inside the individual, what are some transitions you have experienced in your life? The inner unrest that may be part of the initial phase of a transition can also be tied to a nonevent, something and individual wishes to happen that never occurs, such as an expected promotion that never materializes. A chronic hassle, such as a long commute, unreasonable supervisor, or a high workload, can also lead to dissatisfaction that precipitates an inner transition long before there is an external change. 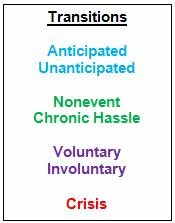 Another way to classify transitions is as voluntary (something you choose) or involuntary (something imposed on you). An unanticipated and involuntary change often creates a crisis for the individual and their social context (family, friends, colleagues, community, etc.). Every transition begins with Endings. We have to let go of the old situation before we can pick up the new one. It’s important to name the losses. 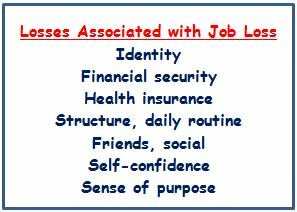 In the case of job loss, there are many losses. What would you add to the list? Accepting the reality of the loss is the difficult work here. Initially the loss may be denied or minimized. Then it may be intellectually processed. The emotional recognition and acceptance of the loss is the most difficult to achieve, and involves a full recognition that job, and all its losses, will not return in the same way. It is often helpful to write down the losses and/or discuss them with a trusted friend or professional. The Neutral Zone feels anything but neutral. It’s that confusing nowhere of being in-between. Many people experience it as a kind of emptiness, in which the old reality looks transparent and nothing feels solid anymore. This is where the inner reorientation takes place. It’s also the place of greatest creativity and potential because nothing is solidified. We may begin to test out some options, explore some new avenues, or develop new skills. We launch forth into Beginnings when we have let go of the old situation, opened ourselves up to new possibilities in the neutral zone, and moved to creating the new situation. Debra Franke, Assistant Director of Alumni Relations for Alumni Career Programs, is available for 1-1 individualized career change coaching. Contact her at 215-991-3582 or franke@lasalle.edu.